Forward Lexie Moe, No. 33, attempts a three pointer in Lions' 61-50 win against Missouri Western on Feb. 24 at Hyland Arena. The women’s basketball team advanced to the MIAA Quarterfinals after defeating Missouri Southern 79-67 Monday night in Joplin, Missouri. The Lions led Missouri Southern 38-31 at halftime as Lindenwood shot 7-7 from the free throw line and 41.9 percent from the field. Missouri Southern fought its way back into the game in the third quarter outscoring the Lions 21-15 which cut the Lions’ lead to one going into the fourth. Lindenwood separated itself in the fourth quarter outscoring them 26-15, eliminating Missouri Southern from the MIAA tournament. 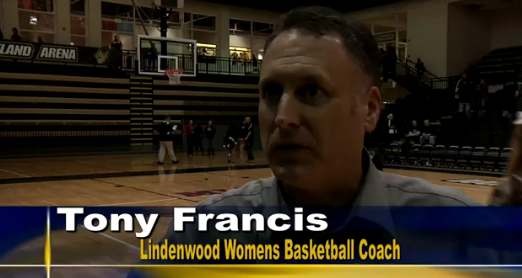 Missouri Southern shot 43.1 percent from the field while Lindenwood shot 39.7 percent. However, both teams shot well from the free-throw line. Lindenwood missed just two free throws as the team shot 91.7 percent from the free throw line, while Missouri Southern shot 85.7 percent from the line, missing three free throws. Guard Lindsay Medlen scored a season high 24 points in the win. Medlen shot 6-15 from the field and 9-10 from the free-throw line, while forward Kallie Bildner recorded her 17th double-double of the season scoring 13 points and grabbing 14 rebounds. Lindenwood’s depth showed its strength as the bench scored 34 points led by forward Gabby Walker. Walker tallied 14 points on 6-9 shooting and grabbed five rebounds. Following the win, Lindenwood will advance to play top-seeded Central Missouri at 6 p.m. on Thursday, March 1, in Kansas City, Missouri.